the lilac lacy scarf is finished and i am happy with the result. two balls of lilac and some mellow purple for the edge makes my very soft scarf complete. if you like to make a similar scarf, below you will find the info. it is not a pattern, only the link to the diagram for the stitch pattern and some notes you can use as a guide. i copied and paste from my previous post(s) but it is more handy to find all relevant info on one page. used pattern is number 2037 of mypicot.com and the route to find the diagram is: mypicot.com – openwork & lace. you can find it here and this is the direct link to the pdf. used yarn is katia peques acrylic yarn with crochet hook size 4.00 mm. more info about the yarn on the katia website. crochet as many chains you need to get the desired length and crochet some extra. after you did row 1 there will be some unworked chains, but you can remove them with a needle with a blunt tip and weave in the yarn end. instead of 3 turning chains at the end of each row i made 2 chains. at the beginning of each row i started with a linked dc my way: draw up a loop in the second ch from hook, draw up a loop in the first stitch of the row (is the last stitch of the previous row), 3 loops on hook (like you have when making a regular dc) and finish like making a dc. more info about linking stitches you can find on internet, there are many tutorials to find. notice that you work into the chains and not into the spaces. follow the diagram until your stole/scarf has the width you want. end with a row 2, 4, 6 or 8 but i think row 6 gives the best result. on the other side of the beginning chains i made row 6, 7 and 8, but it isn’t necessary. on this side you can just crochet a row 2, 4, 6 or 8 too. for the edge i worked along the long sides like this: 1 sc in the double crochets and into the two chains between the double crochets, into the 6 chains i made 1 hdc, 4 dc, 1 hdc (you will understand when you look at the diagram and see row 2, 4, 6 or 8) at the end of the long side you make 1 ch and 1 hdc in the same stitch as the last stitch of the row. at the beginning of a short side you start with a chain and then – divided equally along the short sides – you make 6 chains, 1 sc, 6 chains, ending with 1 hdc, 1 ch and 1 sc into the same stitch, this 1 sc is the first stitch of the other long side of the scarf. this way you work both short and both long sides. i then cut the yarn and attached it again at a short side and made 1 sc in every sc and in every 6 chains 1 hdc, 4 dc, 1 hdc. at the end of the row, cut the yarn and repeat on the other short side of the scarf. weave in yarn ends and you are done! 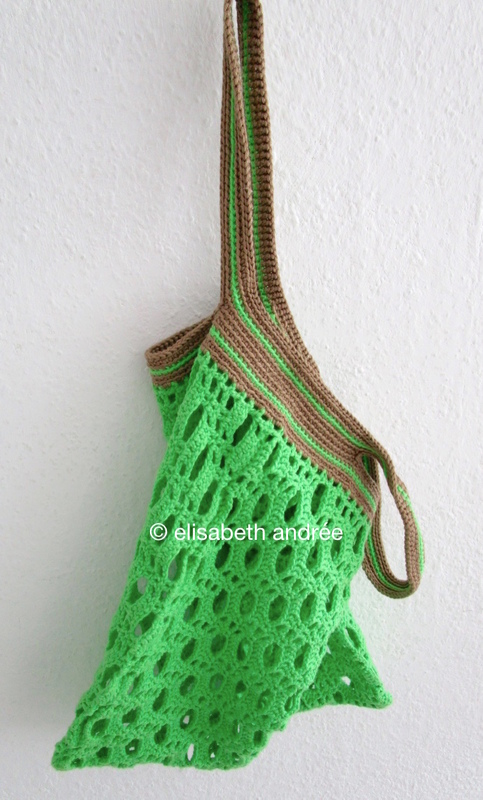 …by the way, this little bag i made years ago with poison green cotton yarn but with the same stitch pattern. Categories: crochet, project done, tutorial | Tags: crochet, crochet stitches, scarf, stitch pattern, tutorial | Permalink. Thanks Evelyn! Glad you like it! Really nice summer scarf! Love the colours too. Happy week for you! Sabine. Thanks so much Sabine, that is kind of you! Wish you a wonderful new week too! I see you are putting your name and copyright symbol on your photo. You never used to do this. Have you had a bad experience with someone using your beautiful photos? Hello Natasja, nice to hear from you! Concerning the copyright symbol and my name on the photos, I do this for quite some time. I have had some bad experiences; someone sold my free pattern for the apricot bag on Listia and someone else used pictures of one of my tutorials on her website and edited them, alas. But, a really big BUT, everyone else I ‘meet’ on my blog, Instagram, Ravelry and Pinterest is very kind, sweet and supportive! Love to have contact with them!